Ms Andrea Nahles, head of Germany’s ruling Social Democrats, who are in a coalition government with Ms Angela Merkel’s conservative CDU/CSU, said in several German press interviews over the weekend that German aid to Turkey, who are locked in a standoff with the US over the house arrest of Pastor Andrew Brunson, is certainly a possibility. According to Ms Nahles (who recently replaced the former head of the party after they dropped to their worst ever level in the recent German elections), declared there could be circumstances in which Germany would provide financial assistance to Turkey as it goes through a severe economic crisis: "A situation might arise where Germany needs to help Turkey, regardless of political tensions with President Recep Tayyip Erdogan,"
"Turkey is a NATO partner who we cannot ignore. It is in everyone's interest that Turkey remains economically stable and that the current turbulence involving its currency can be stemmed." Related coverage: <a href="http://thegoldwater.com/news/34453-President-Trump-Is-Heroically-Fighting-For-Pastor-Brunson-s-Freedom-in-Turkey">Trump fighting for Pastor Brunson’s release</a>. Economic difficulties and the Turkish refusal to release pastor Brunson (which have led to the White House administration threatening to impose further import tariffs on Turkey) have led to the Turkish lira dropping more than 35 percent against the US dollar. Ms Nahler: "the federal government must remain in dialogue with Turkey at all levels." "It is my clear expectation to the Federal Chancellor that, of course, critical issues will also be addressed. In particular, this includes the arrest and detention of German nationals in Turkey." 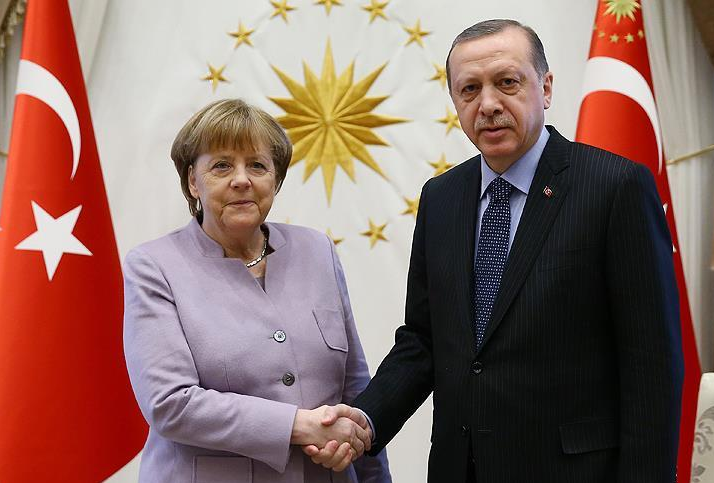 German magazine Der Spiegel claimed that Ms Merkel’s government wants Turkey to consider accepting an International Monetary Fund aid program. Rumors in the German press state that the proposal was discussed during a phone call between Germany's Federal Finance Minister Olaf Scholz and his Turkish counterpart Berat Albayrak last Thursday. Related coverage: <a href="https://thegoldwater.com/news/34203-Pastor-Andrew-Brunson-Turks-Smash-iPhones-Pour-Coca-Cola-In-Toilets-Video">Turks smash iPhones, pour Coca-Cola in toilet</a>. Given that the US taxpayer is the largest contributor to any IMF rescue, this is not expected to go down well in the White House administration. Over the weekend. Turkish President Erdogan stated his nation would resist an "attempted economic coup," as the country was being "threatened by the economy, sanctions, foreign currency, interest rates and inflation." "We tell them that we see their game and we challenge them." Because their banks are invested in Turkey of course, just like they were into Greece before. the good, WHITE German people need a Nazi revolution. Lolol the same pro jihadists crying that they were stopped from sending 400million dollars to IRAN are going to side with Turkey against Trump ? Oh yeah forget turks rule german politics now.